If you are going to launch a new project and already bought a domain, then adding a cool under construction page is a nice idea. In this way, you can also announce the official product launch and start promoting your product along with the development. You can also add Facebook badge and email subscription form to collect subscribers and followers ahead of the launch. You may have seen many brands coming with under construction pages. A simple but cool coming soon page website template with email subscription form. It has a blue background and looks really attractive. If you think it matches the design of your next project, you can upload this. and let your visitors know that your website is coming soon. Collect their emails and notify them when the website is available. Sssoon is another cool Bootstrap coming soon page which comes with awesome look and a form to collect email. It also asks users to share the page on Twitter and Facebook. Ego Cafe is another free coming soon website template. If you are planning to start a business related to the cafe, you can select this cool template. This template will surely give the pleasant experience. Soon is a Responsive template which is compatible with all browsers and devices. In this, you can set the countdown timer and collect subscribers’ email addresses. If your website is related to travel, this under construction template is for you. Note: they have now changed the design. Click on demo link to see the new design. It is another cool responsive CSS template with jQuery timer. The blue background of this template looks beautiful. You also have email optin form to collect emails. Glacier is another cool upcoming website template for your next upcoming project. This under construction website template also comes with social media links and email optin form. Professory is a cool under construction website template for your next educational portal. Color scheme of the template is also very attractive. Avenir is a Free Coming Soon HTML Template with dark background. This will be good if your website is about photos or spritual content. It is another cool website template for adding an under construction page. It will be good doe website with science content. AutoCare is the website template for websites related to auto industry. If you are working on car portal, you can also take a look on car portal templates. Blue Sky is another attractive template. It also has a countdown timer and links for various social media websites. Fotos is also a cool Under Construction website template. It is pure responsive. You can collect emails and suggest people to follow your Facebook and Twitter profiles. 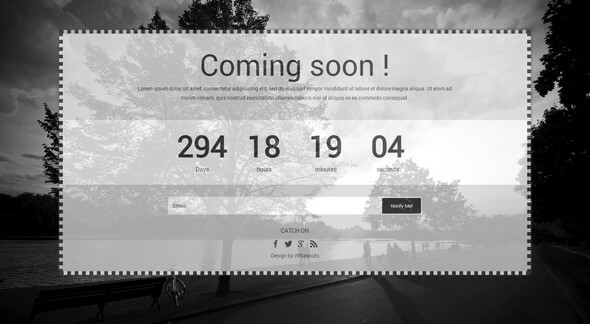 Beback Theme is a cool coming soon template with progress bar and countdown timer. The progress bar works with the launch date. It also suggests people to follow your Twitter profile. Note: Now the template is much more attractive but premium. You can use the below link to see the updated design. NOte: Demo of this template is not available. A free Dark Coming soon web and mobile template. It shows count down time and suggests visitors to follow your social media profile. You can also collect emails to send them notifications later. These are few good Under construction HTML Templates to try in your upcoming project. Select one depending on your project type to match the theme of your project. If you also know something interesting that should be in the list, you can also share the name with us.